It’s 100 degrees outside, close to 80 in my office, and I have a hot cup of coffee staring me down. I need to drink it. I don’t care that sweat is carving trails down my face, taking strands of hair and plastering them to my neck. I don’t care that for the past five minutes little swirly glimmers have been dancing across my room. It’s my morning cuppa Joe. My morning caffeine boost, my headache suppressant. And I need it. It has been accepted! I’d do a happy dance, but I’m sure the exertion would induce seizures brought on by overheating. The story is slated for an August appearance, and as always, I will keep you updated. While we’re on good news, I’d like you to raise your respective glasses and toast to our friend Barry Napier, who has just released the first issue of his new graphic novel, Birdwatching from Mars. It’s currently available for $1.29 an issue on Kindle, or you can wait a bit for the print and PDF versions. This release represents a three year journey, so lets show Barry some support! With absolutely no transition, *shazaam! * New topic. Over a month ago I posted about a daft plan to brew my own beer. 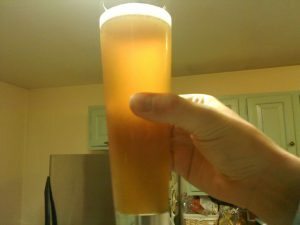 In fact, I *did* brew my own beer, and at the time of posting it was fermenting like a good wort should. I’m happy to say the experimental first batch has come off without a hitch, and I’ve been enjoying frosty cups of Belgian White for the past week. To celebrate my success, I started a new brew: Nut Brown Ale. The Nut Brown has been in primary fermentation for three days now. After a total of three weeks, I’ll bottle, give another three weeks for bottle conditioning, then drink. Yum. If you’ve read this far, I have a question for you, my obsessed readers. A good friend, Indigo Ravenwood, has suggested a new section to the old website entitled, “Ask the Professor,” in which you’d send in questions and I’d answer. Now, I can’t promise I won’t rub my hands together and facetiously answer your questions with the dull wit of a failed comic, but I *can* promise to inadvertently insult you. (I only make promises I can keep). Now go off and enjoy your air conditioned houses while I wallow in my own sweat puddle. No, no. Don’t pity me. I have my cold homebrew to chill my brow.